Before I get into today’s podcast/post, I wanted to thank y’all for your sweet emails and for letting me know how I can help you know God better. It truly helped me see your needs and direct future posts/podcasts. But. . .for today? We’re back to talking about movies. If you are reading via email, click here to listen to the podcast. If you are reading email, on your phone, click here. As you heard on my last podcast with OhAmanda (Amanda White), she and I love movies. We also LOVE to use movies to help talk to our children about God. 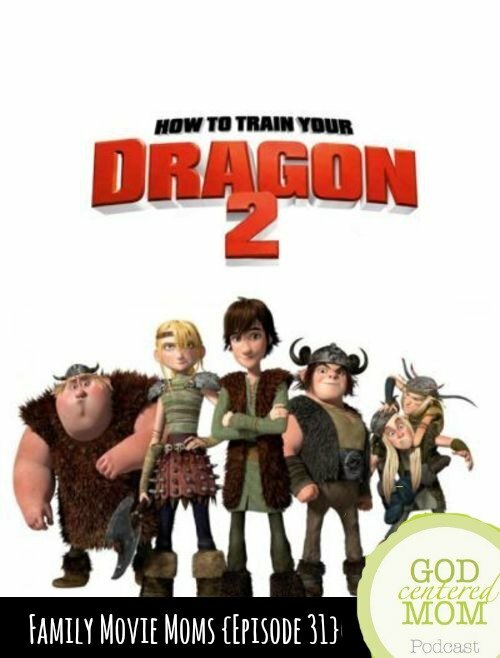 On today’s podcast, she and I chat about the newly released, “How to Train a Dragon 2”. We answer the question, “Is it okay for my kids to see?” We let you know what we did not like in this flick. Stoick, Hiccup’s dad–his role as a protector and his unfailing, redeeming love for Hiccup’s mom. Drago’s tragedy turned angry aggression–how bad things happen, but if we go to God for healing and restoration, it can be used for good. But in Drago’s case, “Hurt people hurt people”. Dragon training as an analogy of parenting styles–harsh/domineering vs. gentle/caring. And the loyalty which results from one over the other. Toothless’ challenge to tune out the alpha dragon and trust Hiccup–when temptations come we need to often close our eyes, cover our ears and trust God to deliver us, overcoming evil. At the end of the week Amanda will be posting her discussion guide and possibly a link-up where you can add your own family movie guide. Choose a film you’ve enjoyed watching as a family and type up some ideas for discussion topics/questions stemming from the movie. Susanna Wesley’s separation from her husband over politics (for 5 months, not a year like I mentioned in the podcast). Join the Family Movie Mom discussion. What themes, questions, and/or conversations did you come up with after seeing this film? My girls and I loved this movie! It was very touching and action packed. They said that their favorite part was the battle between the big dragons (alpha dragons). I asked why and one said because it was exciting. I don’t think they understood the lessons or moral of the movie so this is why a chat after the movie is important. Great job Amanda and Katie! So glad your girls loved the movie! How interesting that they loved that scene the most. I think my boys thought that was the most terrifying. Love how all kids are different! And glad to help further the conversation. thanks for listening!